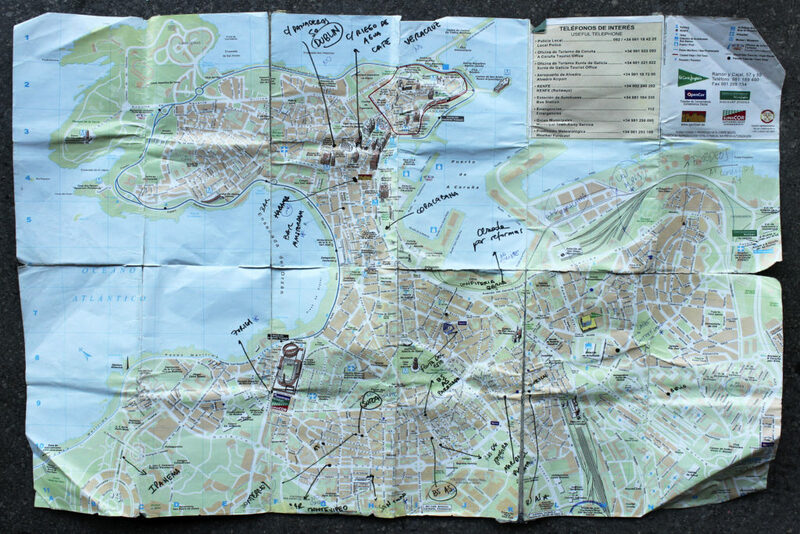 This project begins tracing on the map bars and coffeeshops discovered walking the city, named after other cities: Buenos Aires, Zúrich, Río de Janeiro, Ámsterdam, etc. These places have been the destination of the three Spanish migratory waves in the past to South America first, and to Northern Europe after, around 1960. The project is composed by stories, memories and experiences of the returned emigrants who named their bars as tributes or remainders of their past, recorded in sound and photographic media. Through several layers of information “Allá bien y aquí también” reflects the complexity, the comings and goings, the movements and settlements that have built the Galician individual and collective memory. Project developed during the International art residency programme MAC (Museo de Arte Contemporáneo Gas Natural Fenosa) La Coruña, Galicia.